This is the starting point of my first Primarch project. I’ve been putting off doing any Primarch for a long time because I want the finished model to really capture that extra special something that makes them so special. This particular project features the twin Primarchs Alpharius and Omegon. To do this I’m making a plain body of legs and torso that I will then mold and cast. The two models need to look very similar with a slight modification in pose. I may attempt to do a two part Blu-Stuff mold tutorial with this but it might be pushing the limitations of the material to do so, so we’ll have to see. 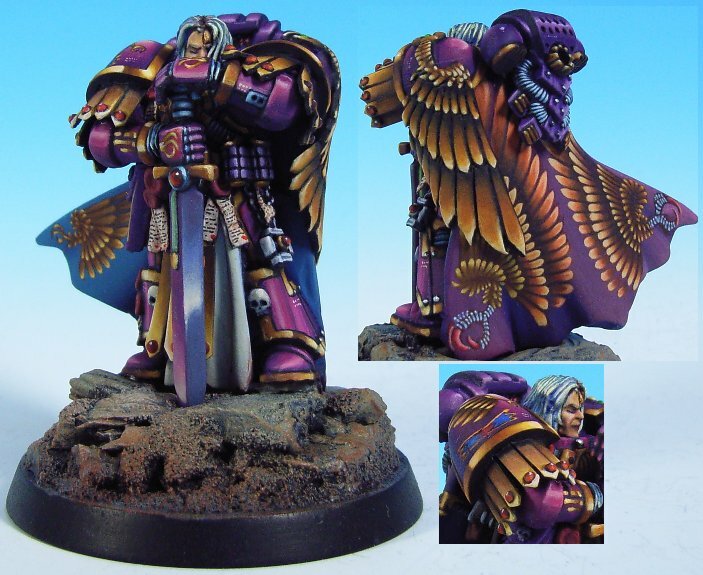 The starting point for me is this image (ironically of a different Primarch conversion). There is something of the “strategist leader” in that pose and will be the what I use for Alpharius. I think Omegon will have a bit more of a “sneaky, in the background pose”. To start this project I begin with the legs as I always do. There are no existing plastic terminator legs in anywhere near the right pose to use as a frame work so I’ve had to resort to sculpting them from scratch. Because of the Alpha Legions leaders being very practical and not ones for unnecessary decoration the armour itself will be fairly plain. I’ll be relying on the cloak to really set the model apart, but I’m also aware that the model being so plain will require it to be very sharply finished. The slightest imperfection in the largely featureless armour will stick out like a sore thumb so it is very important to get the sculpting perfect. This hasn’t been easy, in fact what is shown here is my fifth attempt at making the legs. The pose is finally spot on what I’m after. The feet are perfect, the left greave needs a bit more refinement. The waist and torso will be done fairly easily as the size and shape are already in place and require just a new skin. For the head I’ve stripped down one of the grey knight heads, just because the facial details are so nice and sharp and far and away beyond anything I could sculpt. When I work on Omegon he will use the same head (obviously). I’ve had very little free time the last couple of weeks so progress hasn’t gone as far as I would have liked. I’ve also really struggled to get this accurate. I had to redo the belt strap because my first attempt placed it way too high, and I also ended up sculpting the chest plate twice and even then I had to file it down to size. I think I’m a little out of practice. The helm is just a stand in for the moment. It’s quite unusual for me to cut away, file or sand Green Stuff after I’ve sculpted something but in this case I’m trying to make the model as polished as possible because I want to take casts of it. Whilst I don’t recommend them for the price I have found GWs emery board sticks quite useful for getting a more polished finish, at least easier than using sheets of the stuff. Regardless of the technique I use I’ll try and should how I model and cast this body in my next update. On the whole, I’m very pleased with how this is taking shape. I definitely think the model will need a cloak to help frame the finished thing and mark it out as an extraordinary character. Steady progress on Alpharius and his twin brother Omegon. The tricky thing with this conversion is to make them obvious Primarchs, but also not have them too decorative, as their own modus operandi is to make sure they and all the Legionnaires are largely indistinguishable from one another. At the end of the day I’d rather make them too decorative than not decorative enough, but I’ll try and stay away from flashy details. Since I took these photos I’ve rebased the models (Omegon will show up in the next update) on 40mm bases as thats far more appropriate to such a model. I used Aerion the Faithful’s excellent depiction of Alpharius as inspiration for the sculpting on the chest plate. To do this I added Green Stuff in the approximate shape I needed (see above photo) and pushed it about with size 0 clayshapers and a needle’s pointy end. I also knew I didn’t want to use a stock head for this miniature, but at the same time I don’t feel confident enough that I can sculpt a head from scratch. My solution was to take one of the very nice Grey Knight bare heads and strip it down (removing all details but the face) and use that as a template to sculpt my own face (no, not my actual face) with stronger features. I did this face in four stages, forehead, jaw, mouth and nose. Each stage was a case of creating larger bolder features over the existing plastic. The eyes were left as they were. The end result was a slightly larger than standard head with strong features and I have to say I’m rather pleased with the finish, and is a good halfway measure considering I can’t sculpt heads from scratch yet. On the pics below I’ve desaturated the Green Stuff in Photoshop to make the results easier to see. I still need to add the usual headgear and bionic plugin bit to the rest of the head. Because Omegon is Alpharius’ twin I’ll be casting this face using Blu-Stuff as the mold, along with other artificer details so both models look identical except for the posing. I need to run it by the client, but I’m quite keen on giving Omegon a cloth hood pulled over his head, as suggested by someone on one of the forums. Apologies for the lack of posts so far this year. I had the pleasure of being hacked last week (this site and a number of others) which is one of the reasons this post is so late. Although the actual damage incurred was quite minor and cleaned up within about 3 hours I decided to tidy up and remove any other vulnerablilites. Unfortunately I mistakenly deleted the wrong database, effectively destroying this site. It took me a further 2 days to repair the damage I’d done myself but thankfully I was able to recover everything. I don’t have any work in progress shots of the arms and shoulder pads being added so the best I can do is describe my methods. I first opted to use a sword from the Grey Knight Terminators kit (great kit!) with the power generator bit carefully removed from above the hilt to make it a bit more traditional looking and also make it the correct height for the pose I wanted. The sword was re-assembled from 4 bits: the blade, the guard, the right hand and the handle (grip & pommel). The handle was pinned on but the rest of the parts glued with liquid welding glue to make sure the bond would be clean. With delicate parts superglue can be a nightmare if you’re not careful. I cut out a little gap in the base to rest the tip of the blade in and filled this with Green Stuff to make sure the tip would have a perfect fit when pushed in. The arms started out as standard plastic arms. I basically use them to ensure the size of the arm is always accurate. Spacers (about 1mm) were adding to lengthen the forearms, and the upper arms were replaced with wire (paper clip wire is perfect) which I used to pin the arms to the torso. I then began the process of sculpting a thin skin of Green Stuff over these arms, trying to keep edges as sharp as possible. The forearms, hand, elbow pads and upper arms are all done separately and allowed to cure before moving on, otherwise you are guaranteed to mess something up. The shoulder pads are resin casts of a single pad a made some time ago. They are pretty much a perfect size for this conversion although I had to do a little repair work on the corners. Whenever I try to repair imperfections in smooth armour I always use a soft mix of Green Stuff (as much as 3:1 yellow to blue). This helps to smooth the Green Stuff into the existing shape to keep it as clean looking as possible. Positioning of the pads took sometime to get right. It might sound like a simple thing to attach shoulder pads but the pose of this model can make them look awkward. I did a lot of trimming and shaving of bit of the model that wouldn’t be seen to get the fit just right. Now might be a good time to mention dry fitting. One of the reasons my conversions take a long time is the shear amount of testing and dry fitting of components I do during the build process. I probably spend more time looking at and thinking about a model than actually making it, but (at least for me) it’s all part of the process of getting things just right. At this point I added some more detail to the head, an ear on one side and the usual space marine headset/plugin set up. I knew when I started the project that the swords position in the pose would likely cause some problems obscuring the face. The simple solution was to very slightly angle the head to be facing to the side. Essentially the direction of the head determines the front of the model as it’s the automatic focal point (it’s a human thing for the eye to look to the face first). Next up was the cloak. I’d been playing around with using some wax sheets to help me with the cloak making process but it just wasn’t panning out as I had hoped so I reverted to a more standard approach. I took some of the plastic that Green Stuff comes supplied in and mixed a large amount (2:1 ratio, yellow to blue). After pressing onto the plastic as best I could with my fingers, I took the handle of my large clayshper, wet the handle and used it in a rolling pin fashion to spread it as thinly and evenly as possible (as shown above). I left this for about 1 hour before applying it to the mini. Leaving the plastic in place I pressed it into the back of the model and tried to shape it into something well “cloak shaped”. This was then left for a good few hours before peeling the plastic off. I deliberating made this rough cloak too large, because at the end of the day you can always trim is down, but adding new Green Stuff is a lot harder. Even though this was pressed into the back of the model once it was fully cured I was easily able to remove it and the dry fitting process began. I slowly whittled down the edges of the cloak with a scalpel making sure the overall shape was what I wanted by continually testing it on the model. Once I got the shape right I then set to work on it with “wet & dry emery paper” under a running tap, cleaning it up and sharpening edges. Looking at it so far, I’m at the stage now where I can start detailing up, I just want to be careful not to go overboard. The back pack definitely needs work to make it more fitting for a Mark VI suit. I think the cloak needs some more work for sure, either decoration like the hydras on the chest plate or maybe more folds and flowing shapes (or both). So far I’m really really liking how this is shaping up. Also, here’s a quick pic of Omegon (Alpharius’ twin). As I’ve said before, I want to try and make Omegon a bit more stealthy/shadowy posed. At the moment I see him in a sneaking forward pose with him in the process of drawing his sword from a scabbard. However, we’ll have to see how that evolves. With the exception of the bases the Primarch twins Alpahrius and Omegon are now finished. This has probably been my most challenging project to date. The whole thing is about 90% self sculpted with a few bits used as armature to sculpt over. Alpharius especially is one of my favourite ever and I’m tempted to model a Space Marine Captain for my own collection based on him. Starting off from where I left off last update, I detailed the back of the cloak with similar hydra iconography that I’d previously added to torso, three on each side. After this I then molded the cloak with a big chunk of Blu-Stuff ready to make a replica for Omegon. There is just enough flex in that mold to remove it from the model even though it is partially wrapped around it. I then filled the mold with soft Green Stuff, smoothing it out with a large round cup soft clayshaper on the inside of the cloak. I waited 1 hour for the Green Stuff to firm up a little but not too much. This allowed me to carefully remove it from the mold without wrecking it and also fit it to the Omegon, shaping it more to my liking. I wasn’t entirely certain how to pose Omegon so I was going to just see how it evolved. After attaching the new cloak I thought of doing somthing similar to GW’s Master of the Fleet model where he’s gripping his cloak in one hand (sort of pulling it back. Whenever a model has a cloak, purity seals, banner or other fabric item I always try to imagine wind blowing in a specific direction. In this case the wind is blowing his cloak from behind and to keep it out of the way he’s pulling it back with his free hand. Next up was shoulder iconography. The client specifically requested a design for the shoulder pads to emulate this piece of artwork he forwarded to me. As you can see Omegon differs from Alpharius in that he bears the Omega symbol. Because the icons appear on right and left pads I made life easier on myself and molded both in Blu-Stuff. I then filled the impression of each icon with Green Stuff and pushed it onto the opposite pad (rather than letting it cure and gluing it in place after). The tiny chains around the outside of each icon were added later on. I did these chains in sections, doing the loop parts first, and after they had cured adding the tiny links between each of the loops. Anyone sculpting tiny details like this might want to ensure a more yellow than blue mix to keep the Green Stuff extra sticky and help it adhere to the plastic/resin surface better. The final element was to replicate the head (again using Blu-Stuff) and redesign the backpack into something more akin to Mark 6 Power Armour. To replicate the head I made a cast of the face and after it had cured re-scupted to rest of the head. For the backpacks I used my standard approach of cutting the ends off of two backpacks and gluing them together to make one wider backpack (an alternative is to cut one in half, add a plasticard spacer and fill the gap with Green Stuff). I sculpted the layered style of armour on top of the plastic one layer at a time, starting at the bottom. After I had done this and added an extra layer of armour to the top and made a copy using, yes you guessed it, Blu-Stuff. The copy needed a little cleaning up but nothing major. The final step was to add rivets (from the Grandt Line product range). This final pic is kind of how I imagined the finished models in my minds eye when I started the project with Alpharius in his commanding pose and his secret twin brother skulking in the background. I’ve not done anything more to the bases than provide platforms (supposed to be discarded/wrecked metal of some kind) for them to stand on. I may detail them up but at the moment I’m assuming the client will want these to match the bases on the rest of his army. On the subject of which, when these two models are stood next to regular Space Marine minis they do look suitably “Primarchy” (see previous update for size comparison pic). I was slightly concerned at the beginning of the project as to whether I could pull off that “Primarchy” look without super detailed and stylised armour. I can’t help but admit I’m very pleased with these, and I’m rather looking forward to my next Primarch (Sanguinius) and some very ornate and detailed armour, I think that’ll step up the challenge to new heights. I’m sure I’ve left out huge chunks of detail and obvious stuff so if you have any questions about this project please leave a comment and I’ll do my best to answer them. Next story Mold Making by an Idiot. Previous story Doom-Bull gives you Wings!